Markette has been featured on top-rated national morning shows, including NBC's TODAY Show, VH1's Big Morning Buzz Live and on ABC’s Live! with Kelly in the Coast-to-Coast Cohost Search, where she used her digital and multimedia storytelling background to launch a full-scale social media campaign to garner America's hearts and votes, ultimately ascending to become a Top 4 candidate – the youngest and last woman standing in the nationally televised competition. Markette is also founder of the The GLOW Brands, LLC, a multi-media company aimed at illuminating perspectives around the world through multimedia and live event consulting and speaking engagements. 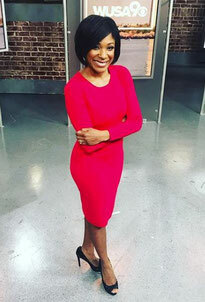 Markette earned a master's degree in interactive journalism from American University in Washington, DC and a bachelor's degree in communications from California State University Dominguez Hills. Markette (center) with Kelly Ripa on "Live! with Kelly." THE LOS ANGELES TIMES award for excellence in student journalism. "My Rainy Day Rocket Ship"